Rack panels form part of standardised 19-inch rack, which are used to house electronic equipment. Rack panels protecting the equipment from dirt and dust and lend a finished look to the rack unit, while allowing sufficient ventilation. How do rack panels work? Once the 19-inch rack has been built and the equipment properly housed, the rack panels can be added. They are mounted by using their protruding edges, or 'ears', as a way to fasten them to the rack frame with screws. They then provide a barrier between the equipment and the outside. Effectively, they fill the space between different modules on the rack. 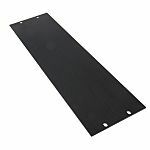 The main difference between different types of rack panels is the material used. They can be made from plastic, metal or glass. Metal rack panels are very durable, while glass rack panels allow you to see through to the equipment inside without needing to take the panel off. Plastic rack panels are a good all-purpose option.